Prof. John Muyonga handed over office to Dr. Abel Atukwase, the new Dean-elect School of Food Technology, Nutrition and Bioengineering. The handover ceremony was held on Thursday, Jan. 17,2019 at the School’s Conference Hall. Prof. Muyonga has served as Dean for two four-year terms since 2011 when the university turned collegiate. His term expired on December 31, 2018. Presiding over the function, the Principal, College of Agricultural and Environmental Sciences (CAES), Prof. Bernard Bashaasha commended Prof. Muyonga for running the School for eight years and doubling the graduate programmes in terms of curriculum design. “In terms of research, your School has the second largest chunk of research resources in the College and some outstanding infrastructure. The Food Technology and Business Incubation Centre (FTBIC) is a flagship both at Makerere University and the East African region,” the Principal said. Professor Bashaasha hailed the outgoing Dean for keeping the Human Resource Team united, conflict-free and maintaining a good working relationship with the Principals office. He congratulated the incoming Dean, Dr. Abel Atukwase upon his victory adding that he has some work to do in terms of harmonizing the school. “Just be yourself, serve everybody regardless of who rallied behind you. Bear in mind that you are serving not because you are the best but because you were trusted to serve in this particular time and you will hand over the mantle to another person. Your mission is to add value to what Prof. John Muyonga has done because the foundation has been set,” he advised. The Principal also advised staff to treat pledges as ideas which can be picked, reshaped and achieved afterward. He described pledges as promises, well-thought ideas and good indications subject to assessment. Prof. Bashaasha described leadership as God-given and welcomed Dr. Abel Atukwase to the College management. He said the college works as a family and there is room for discussion. Outgoing Dean, Prof John Muyonga described the handover as a happy moment and thanked college staff and university management for being supportive. He said when the school began, they came up with a mission, discussed it and came up with six goals to increase visibility. He highlighted the achievements under his tenure including; an increased number of courses, acquisition of an additional building and equipment as well as upgrading the engineering workshop at MUARIK. Other achievements according to Prof. Muyonga include enhanced collaborations with national and international partners, improvement in research and acquisition of three motor vehicles. Some of the challenges he said include limited space for lecture rooms and staff offices. He highlighted areas that the new Dean needs to look into including; follow up with NCHE on the new courses, renovations, letters of staff appointment, FTBIC contract staff, staffing gaps, evening programs for MSc and incubation programs and improving the level of laboratory productivity among others. Based on his personal experience, Prof. Muyonga advised the incoming Dean on a number of issues pledging his continued support. “As head, it is good to have a big project other than waiting for the Principal to take care of the things the center cannot. On enrolment figures, you need to attract numbers and quality. We have reasonable equipment for food processing but you can do more by bringing the Private Sector on board. Ensure technicians can operate equipment and have relevant expertise,” Prof. John Muyonga advised. The incoming Dean, Dr. Abel Atukwase referred to the election process and handover as great days and a slightly new age for the school. He thanked the staff for choosing him as Dean and the Principal for facilitating all the processes in School. Dr. Atukwase also appreciated the outgoing Dean for steering the team for the past 13 years both as Head of Department and Dean. “I promise that through the support of colleagues, I will keep it a very active School. I am inheriting a firmly laid foundation and hopefully, I will get it to better heights,” stated the new Dean. 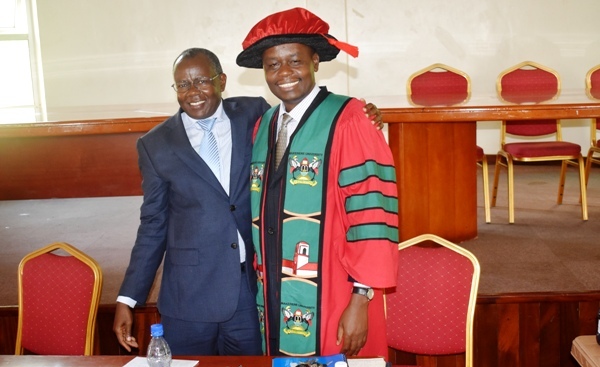 Dr. Abel Atukwase thanked Prof. Archileo Kaaya for mentoring him as his teacher and supervisor both at undergraduate and Ph.D. levels and giving him the opportunity to act as Head of Department when he became Lecturer. This he said gave him the confidence and opportunity to meet people in management. Prof. Kaaya lectured and mentored both the incoming and outgoing deans. “As we move forward, I count on your support. We have a strategic plan under development and I pledge that my School will work towards supporting the strategic plan of the College and University. I will be there to fulfill the objectives and keep activities moving to ensure we don’t backslide,” Dr. Atukwase said. Abel Atukwase pledged to work hard and together with staff, add value to the School. He reported that Prof. Muyonga had been mentoring him to better understand leadership issues. “I am more energized now that I have been given the responsibility to steer the school and I won’t let down the School program down. I promise consensus to avoid crisis. My leadership ingredients are integrity, honesty and focus,” Dr. Atukwase pledged. He appreciated his campaign team for the job well done and promised to serve everybody. The representative of Director Internal Audit Makerere University, Mr. William Ssebanakitta described the outgoing Dean as a well-informed person and challenged the incoming dean to emulate Prof. Muyonga and to be cooperative. Prof. Archileo Kaaya said both deans were his students and thanked Prof. John Muyonga for steering the school along the right course. “He has been transparent and this is a legacy he is leaving. Abel, you have seen. The administration is complicated. You need to be very calm and transparent. Make the Dean’s office simple. Let us come to your office. Remain free and interact with all staff so as to forge togetherness. You still need to grow academically. We need to see you above the rank of Senior lecturer and therefore this position needs balancing”, Prof. Kaaya who is also Head, Department of Food Technology and Nutrition advised. Kaaya also advised that administration sometimes requires hands-on supervision. He told the incoming Dean not to think about those who never gave him the vote, but to serve above self. Speaking on behalf of the technical team, Mr. Balamaze, who is currently undertaking a Ph.D. thanked the outgoing Dean for contributing to his MSc. “Abel, you have been with us. You know all the potholes and I am sure you are going to do a good job. We would like to see labs become more vibrant”, he said.